c) demonstrate a thorough working knowledge of the principal players involved in the stylistic development of the various periods related to jazz improvisation. Scales (major, minor (nat., mel., har. ), blues, whole tone, dim etc. Analysis of major and minor harmony. Subdominant minor and modal interchange chords, chord scales, melody and harmony relation, substitute dominants and related II-7 chords, diminished chord scales, modulation. 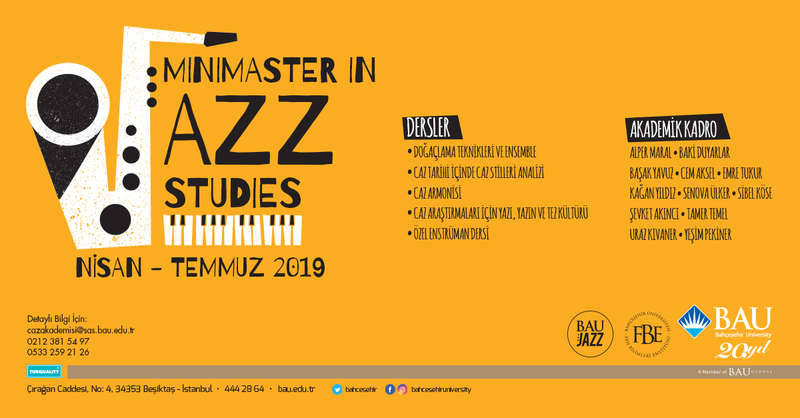 This course will provide students with chronological study of jazz, with insightful commentaries on it’s origins, and full descriptions of the various styles of jazz and the personalities that have contributed to this innovative form of music. This study is a necessary foundation for students to analyse, connect and compare diferrent jazz styles within curicial periods of jazz history. It also gives students in-depth analysis of musical elements such as jazz music forms and its technical appendices that discuss advanced music theory concepts. Introduction, Standard form, Listening techniques in jazz. Introducing brief examples from all jazz periods and styles. Tracing the origins of jazz and learn how to interprete/sing/and play any melody withing jazz genre. Swing:Analysis of Big Band / through the form analysis and transcription of bigband compositions and arrangements of prominent Bigband leaders such as Benny Goodman, Artie Shaw, Count Basie. Jazz Singers: Analysis of their singing styles and transcription of their variations and improvisations. AACM Second Chicago school, free jazz and John Zorn. Listening and styles analysis.